New Haven, CT – The Walter Camp Football Foundation has announced its All-America Alumni NFL Offensive and Defensive Players of the week for games ending September 28. About the Award: The Walter Camp Foundation has more than 300 of its All-American alumni currently on NFL rosters. The Foundation’s All-America teams date back to 1885, and the Foundation has also selected a Second Team since 1998. Each week during the NFL regular-season, the Walter Camp Foundation will recognize one offensive and one defensive player as its Alumni Players of the Week. A.J. Green had 10 receptions for 227 yards and two touchdowns (80 and 7 yards) as the Cincinnati Bengals defeated the Baltimore Ravens, 28-24, to remain undefeated (3-0). A three-year standout at the University of Georgia, Green was a Walter Camp Second Team All-America selection in 2010. Jordan Hicks recorded 10 tackles and one interception the Philadelphia Eagles defeated the New York Jets, 24-17. 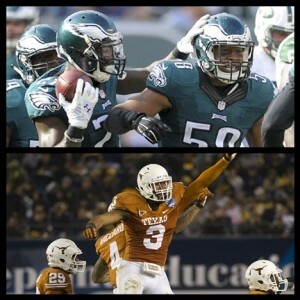 A collegiate standout at the University of Texas, Hicks earned Walter Camp Second Team All-America honors in 2014.